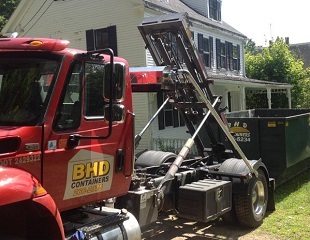 BHD Containers, LLC is a local family owned and operated company. BHD Containers offers roll-off container delivery & pickup at your home, business or jobsite. 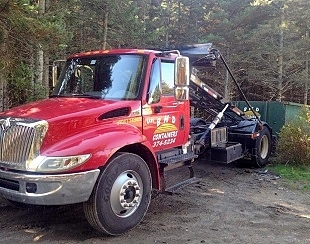 They have been serving the Hancock county area with dumpster (roll-offs) and disposal services for over 30 years. Owner/operators, Vaughn and Melanie Leach, have one goal: to deliver quality, value, and, most of all, with service to the Blue Hill, Belfast, Searsport, Bucksport, Bangor, Mount Desert Island, Lamoine, Ellsworth, Corea and Stonington Maine regions. 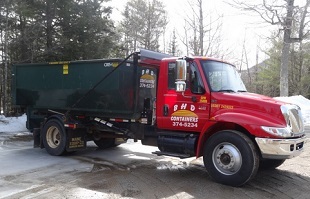 Today, BHD Containers enjoys a reputation throughout the area for unparalleled service to customers in Hancock and Penobscot counties. Roll-off container rental service is our specialty. We have the experience and the know-how to recommend the correct type and size container for your particular needs. The roll-off container is the most efficient method for disposal at your construction site, home renovation project, water damage, house clean-out, yard and brush clean up, commercial or municipal debris. They eliminate the need for your own receptacle as well as manpower to dispose of all your debris. Our roll-off containers will help to keep your site organized and safe for employees, subcontractors and clients. Because we are owner operated, we can provide unparalleled service . . . usually with same-day turnaround. "Committed to making your project our priority." Please call us at 207-266-2975 or 207-374-5234 to learn more about rental rates for the Roll Off Containers Services we offer throughout the greater Down East area.